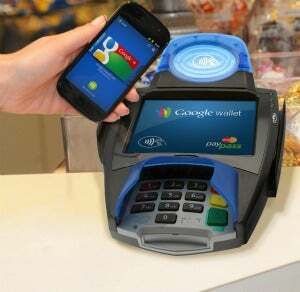 The much-anticipated Google Wallet app debuts today–for now, available only on the Sprint Nexus S 4G phone. The app is the latest to use Near Field Communications (NFC) technology to facilitate payments–customers pay for items in brick-and-mortar shops by tapping their phone to a vendor’s PayPass reader, a small box for transmitting data that can be found in major retailers like Macy’s, Whole Foods, and McDonald’s. To get its app off the ground, Google partnered with MasterCard, which has been using NFC chips on some of its credit cards since 2003, and originally developed the PayPass reader. I took Google’s anticipated new app out for a spin in San Francisco, and while it’s extraordinarily cool when it works, the experience isn’t seamless yet. The app itself stalled for a good 20 minutes once while registering a payment, but other than that it was really simple to use. More important, I found that the PayPass readers in merchants’ stores were often broken or malfunctioning, something Google and MasterCard need to fix quickly if this app is to become the revolutionary new method of payment it promises to be. Entering a PIN in Google Wallet. When I received the phone, Google had already set up a PIN for me to access Google Wallet. Entering the PIN turns on the phone’s “secure element” chip, allowing transmissions between the NFC antenna and the PayPass reader. When the PIN isn’t entered, the chip is turned off, and when the phone’s screen is off, the NFC antenna is off, so that you can’t, say, have the phone in your pocket and “accidentally” purchase something, or have your money stolen via a malicious NFC reader while you’re on the train, for instance. 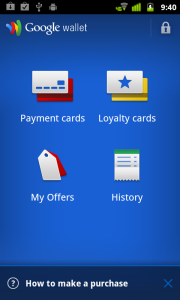 Google Wallet lets you view your payment cards, loyalty cards, Google Offers, and payment history. By default, the app forces you to reenter the PIN every 5 minutes, but I found it somewhat annoying to reenter this number every time I wanted to check something in the app. I settled on 15 minutes. 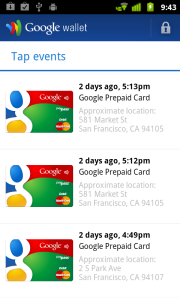 Within the Google Wallet app, you can view the cards linked up to your phone and select a default payment card, but there are also options to add and use loyalty cards (if you frequent a vendor that offers these, you can manage your transactions through this), discounts from Google Offers (any coupons you might receive through Google Shopper will be pushed to this part of Google Wallet), and you can view your payment history. Payment history in Google Wallet can tell you only what card was used and what time the transaction occurred, and you can opt in to use the phone’s GPS to attach a location to each purchase. However, the app’s payment history folder doesn’t list how much you spent, so you still have to keep your receipts. Once I selected the Google Prepaid card to be my default card, I went out to use it. Currently PayPass readers are available mainly at major retailers, but a few small vendors in the San Francisco area do take PayPass–such as Cafe Blanco on Sutter Street in SF’s financial district. My first purchase was there, and I ordered a latte and a croissant. The manager of the store was working that morning and told me that many of his customers use his cafe’s PayPass reader with their NFC-enabled credit cards, and he’d never had any problems with receipt storage. On my end, paying was easy: The phone gave a quick vibration, and the reader beeped when the transaction happened.The purchase required a signature, so the manager printed out a receipt and I signed it. Having Google Wallet didn’t make the transaction itself any quicker, but it was easier just to reach for my phone to pay instead of digging around in my backpack for my physical wallet and credit card. 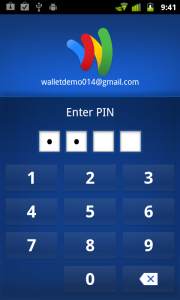 Google Wallet connects to a PayPass reader for a transaction. On a recent Friday afternoon I took the Google Wallet app out again for more sustained shopping. My first stop was a Whole Foods on 4th Street in San Francisco, where I grabbed an onion, some asparagus, and a bottle of wine for dinner. Payment was as easy and effortless as it had been at Cafe Blanco, but the cashier seemed seriously indifferent to my ability to pay with my phone, which surprised me a bit. But one of the great advantages of Google Wallet is how natural it starts to feel. Once you’ve paid with your phone a few times, or have seen a phone payment, it starts to become as natural as pulling out an old-school credit card. I also had installed a bandwidth monitor to see just how much data the app would set you back per payment–248KB, as it turns out, which is about half of what it takes to upload a photo to Facebook from your phone. Luckily, Google Wallet doesn’t appear to be a data-eating beast. As I left, I noticed that the balance on my Google PrePaid card hadn’t deducted the $13 I spent at Whole Foods, which was slightly disconcerting. I exited out of the app and hoped it was just taking some time to refresh. After Whole Foods I stopped by an Office Depot near Market Street to purchase some batteries. I had been in there several weeks before and tried to buy pens with an earlier version of the Google Wallet app, but the PayPass reader had been malfunctioning. Nothing changed this time, either: I held my phone up to the reader, and there was no vibration or beep. “None of these ever work,” said the cashier, who declined to have her name mentioned in this article. “Customers are always frustrated because they hold up their card and nothing happens,” she told me apologetically. I was frustrated, too, as I dug around in my backpack to find my wallet at the bottom of all my groceries. You can opt to link your Phone’s GPS to your Google Wallet purchase history. I ended up paying with my debit card, again. As far as I can tell, neither of these two failed tap-to-pay experiences were the fault of Google’s app, but rather the fault of the PayPass readers in the vendor’s stores. But it would behoove Google and MasterCard alike to make sure that vendors know who to call when something goes wrong with their readers, and to have vendors teach their cashiers how to restart a malfunctioning reader. As long as paying with a credit card is a more consistent experience, Google Wallet won’t revolutionize payments, and will merely remain an alternative for the most tech-savvy consumers. Soon after I was declined payment at the Peet’s coffee shop, the balance on my Google Prepaid Card corrected itself, and showed that I had a little over $4 left. Over the weekend, I took the Nexus S phone to a CVS pharmacy in Oakland and grabbed some razors and cereal. Together, the items cost over $5, but I wanted to see how the app reacted when I went over my balance on my Google Prepaid Card. As it turns out, the transaction was amazingly easy: I held my phone up to the reader; it vibrated, and the reader beeped, deducting $4 off my bill, and allowed me to pay the rest of the bill in cash. The ease with which this worked amazed the cashier, who commented, “Wow. You’re the first person I’ve ever seen use a phone to pay for things.” One thing is certain: When Google Wallet does work, it makes you look very cool. Google’s Wallet app is a really easy way to pay for things when it works, and when the app itself stalled, it corrected the error relatively quickly. The weak link in the chain are the vendors’ PayPass readers, which need to work better, or be easier to service. Of course, Google Wallet is brand-new and available only to a limited audience at the moment, so the tap-your-phone-to-pay experience has room to grow. Hopefully the problems I experienced will get worked out over the coming months. Google has said that it hopes to expand the technology to other phones, carriers, vendors, and credit cards, but until then, the tap-your-phone-to-pay experience will remain a novelty, and a secondary form of payment.